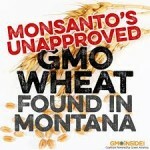 The USDA has announced its investigation into another incident of unauthorized release of genetically engineered (GE) wheat, this time in Montana. The new report highlights the contamination threat to farmers and the environment. The what was found to be genetically resistant to Roundup. The genetically engineered wheat was found growing at the Montana State University Southern Agricultural Research Center in Huntley Montana. The location was used by Monsanto and researchers to grow GE wheat as a part of a field trial between 2000 and 2003. No explanation has been provided as to why GE wheat was growing at the location, although the theory is that even after field trials have ended, the GE plant continues to propagate leading to the continued contamination of fields and successive what crops decades later. GE wheat is not deregulated by the USDA and any experimental use of GE wheat must have the approval of the USDA and be grown under USDA guidelines. It now appears that the GE material persisted, leading to the continued contamination of fields and successive wheat crops a decade later. The Oregon and Montana cases show that experimental use (field tests) of GE material does in fact lead to long-term transgenic contamination, isolated or not. Environmental concerns have arisen as wheat pollen is carried by the wind and the plant is self-pollinating. Cross-pollination occurs frequently and increases during dry and warm weather conditions. Farmers, both organic and non-GE operations, are severely affected by GE contamination to enormous costly measures to ensure their crop’s integrity. Once contamination occurs Farmers have no recourse available to them. Monsanto has conducted 279 field trials of Roundup Ready GE wheat on over more than 4,000 acres of land in 16 states since 1994. ← Obesity promoted by a certain type of gut bacteria.